Key Words: Russia; Kamchatka; epithermal; gold; exploration; mining; Asacha; Rodnikovoye. Exploration in Kamchatka by Soviet geologists, starting in the 1970’s, lead to the discovery of seven epithermal gold deposits, each with the potential to contain 1 million ounces each, along with numerous deposits and occurrences. TSG/TZ will begin gold production in 2005 from two of these deposits located in the south of the peninsula, namely Asacha and Rodnikova. Veins at Asacha and Rodnikovoye are hosted in typical epithermal structural settings, including fractures, splays, pull-aparts and jogs, in association with with high-level felsic intrusions. Vein mineralization comprises mainly quartz-adularia-carbonate. Gold is associated with the quartz phase; higher grades are locally found in silver sulphosalt bands. Textures include crustiform banding, colloform banding and drusy quartz, typical of vein deposition in high-level, low-temperature epithermal environments. The lack of detailed exploration in Kamchatka means that further exploration could lead to the definition of significant epithermal and porphyry deposits. Trans-Siberian Gold Limited (TSG) was founded in the year 2000 by private investors that desired to purchase Russian gold assets and develop the projects to international standards. Following a period of selection, TSG purchased the Veduginskoye project in the Krasnoyarsk region of south western Siberia (Veduga, 100% ownership), and the Asachinskoye and Rodnikovoye projects in southern Kamchatka (Asacha and Rodnikovoye, 90% ownership of each). In the years 2001 to 2003, the projects were brought to international standards using funding from private equity sources. A feasibility study was completed on the Asacha project, based on 20,000m of drilling data provided by the previous Canadian owners, and on previous Russian work. A program of exploration drilling was undertaken at Veduga. This paper concentrates on the TSG/TZ projects in the south Kamchatka region. The Asacha project contains 1,031,000t of ore at 16.3g/t Au for 521,000oz in the measured and indicated categories and 267,000t of ore at 11.4g/t Au for 95,000oz in the inferred category, above a 6g/t cut-off (Canadian NI 43-101 classification). Start up for the Asacha project with a planned 200,000 tpy underground operation at a grade of 15g/t for 90,000 oz per annum, using the cut and fill method, is projected for 2005. The Rodnikovoye project, 65km to the north of Asacha, contains 470,500t of ore at 8.75g/t Au for 132,000oz in the indicated categories and 303,500t of ore at 7.67g/t Au for 75,000oz in the inferred category, above a 4.5g/t cut-off (JORC classification). Rodnikovoye will contribute feed to the Asacha mill in a 40,000 tpy open pit operation that will exploit high-grade ores (13g/t Aueq) starting in 2005 and add another 20,000 ounces per year, bringing production from both deposits to 110,000 ounces per year. In addition, the license areas surrounding the two projects are under-explored and additional resources encountered during near mine exploration are expected to further extend the mine life. South Kamchatka was only opened up to systematic mineral exploration work by Soviet geologists in the 1970’s. Previous to that, due to its strategic position in relation to Japan and the Alaskan archipelago, the Kamchatka peninsula was virtually closed to all but military personnel, most of whom are based near Kamchatka’s administrative capital, the port of Petropavlovsk-Kamchatsky (PK). Indeed no foreigners were given permission to enter Kamchatka until 1992. Development of the deposits has thus far been delayed by economic instability and the lack of infrastructure. The two southern-most deposits, Asacha and Rodnikovoye, are located in the part of the peninsula with the best developed infrastructure, including the Mutovskoye geothermal power station, the Tolmachovskiy hydroelectric dam, the port at PK, the dock in Mutnaya Bay and access roads. 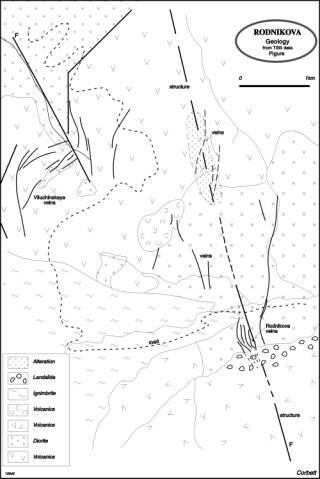 This paper is based on three site visits to the Asacha and Rodnikovoye deposits, including underground visits to Asacha, in the period 2000-2003 and examination of the extensive Russian and Canadian data set in PK. Dr. Greg Corbett accompanied the author on a two-day site visit in September 2001. Figure 1. 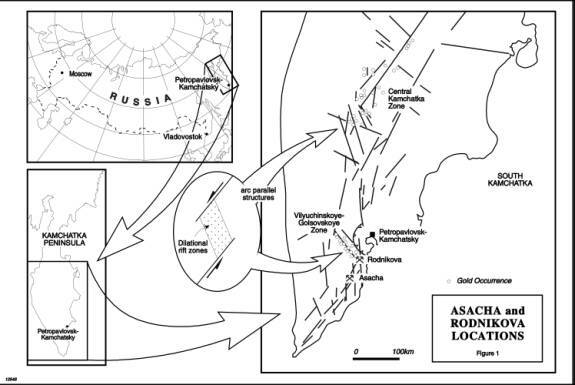 Locations of the Asacha and Rodnikova projects and the VG Zone in southern Kamchatka showing the rift setting interpreted by Corbett (2001). Kamchatka occurs as a Tertiary volcanic arc that extends north into the Chukotka province of mainland Russia and related to the present day Aleutian subduction zone. Deposits of epithermal-type, and porphyry-types in northern Kamchatka (eg. Krasnogorskoye and Tumanoye copper-molybdenum); copper-nickel in central Kamchatka (eg. Shanuch), as well as placer gold and platinum occur. 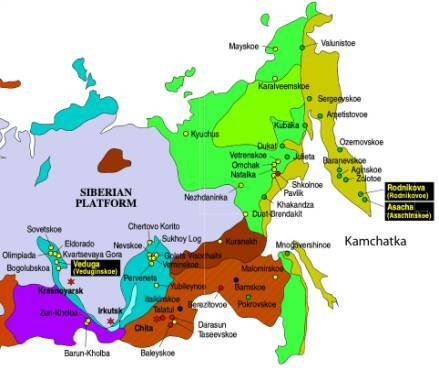 The Kamchata-Chukotka arc itself has continued to be active to the present time. In deposits of epithermal type, the ground is prepared by opening up along intersections of deep crustal faults by tectonic movements and is subsequently filled by intrusion-related, metal-rich, hydrothermal fluids. A review of the 1:1,000,000 scale topographic map suggests the mountainous spine of Kamchatka may contain several NNE trending major arc parallel structures defined by linear valleys or the alignment of volcanoes. The arc-parallel structures are seen to be offset by a series of transverse fault systems that may be comparable to those that localise intrusion-related ore systems in many other Pacific rim magmatic arcs (Figure 1, e.g., Porgera, Papua New Guinea; Lachlan Transverse Zone, Eastern Australia; Pascua-Lama-Veladero structure, Chile-Argentina; Yanacocha District, Peru (Corbett, 1994 and 2001). Most of the he Kamchatka epithermal deposits can be classified as low-sulphidation quartz-adularia type (Corbett 1994 2002) and they consist of narrow, high-grade, sheeted vein systems. Strike lengths of vein systems are typically up to several kilometers and widths typically several meters. Vein systems tend to occur clustered in favourable host rocks and are especially associated with post-volcanic magmatic domes of Tertiary age. Some of the deposits continue to experience hot-spring activity (eg. Mutnovskoe and Rodnikovoye). Seven deposits on the peninsula have the potential to contain greater than 1 million ounces of gold in each (see figure 2). These are, from north to south in the peninsula: Ametistovoye, Ozernovskoye, Baranevskoye, Aginskoye, Zolotoye, Rodnikovoye and Asacha (see Figure 2). Average grades for the deposits range from 10g/t (Rodnikovoye) to 43g/t (Aginskoye). Four deposits in Kamchatka were registered with the state gold resources inventory of the Russian Federation by the 1st of January 1998. The four deposits were Aginskoye, Ametistovoye, Asachinskoye (Asacha) and Rodnikovoye, the last two of which are licensed to TSG/TZ. Figure 2. Locations of the major gold deposits in eastern Russia and the main deposits in the Kamchatka-Chukotka volcanic belt (TSG data). A three km-wide zone of ring fractures surround the Asacha deposit. Within the vicinity of the Asacha deposit the dominant host rock lithologies are propylitized lithoclastic tuffs of andesite-dacite and andesite composition that are intruded by subvolcanic bodies of andesitic to dacitic composition. Deep-seated subvertical re-activated basement faults localised these high-level intrusions and volcanics, together with associated mineralization. The ore zones dip steeply within the faults in the host lithologies. The andesite-dacite subvolcanic intrusions or dome structures are the most important host rocks because they are interpreted as being more amenable to brittle deformation than the surrounding and overlying tuffs and contain wider and more continuous veins. The Main vein zone continues north of the dacite dome, into low lying tuffs and a late andesitic subvolcanic intrusive but according to drilling it thins out and becomes discontinuous after about 2km. The ratio of Au:Ag decreases from over 2:1 at the top of the system to 1:20 at the bottom, over a vertical interval of 200-250m. Figure 3. Asacha vein system. From Corbett (2001) using TSG data. The most important veins are hosted by NS trending fault-structures that cut through the Asacha license area and continue to the north and south. Mineralization is concentrated in the 1.5 km long Main zone in the centre of the license area which contains 95% of the resources. Splays are especially developed at the top of the vein system. It was suggested by Corbett (2001) that jogs and NW flexures localised at cross-structures in the generally NS veins could represent favourable sites for ore formation. The Eastern Vein Zone is composed of a cluster of north-south trending veins that so far have been subjected to limited drilling. Veins are banded and comprise alternating layers of quartz, usually as white to pale grey chalcedony, bluish opal with crustiform textures, with layers rich in adularia, quartz pseudomorphing carbonate, and lesser dark sulphidic bands termed ginguro bands. Landslides displayed on the Russian geological mapping and examined in drill core are interpreted to have been active during ore formation and so locally disrupt veins which form above and below these structures, but are best developed in the lower portions. At Asacha extensive post-mineral ash cover obscures outcropping veins, structure and host rocks. The two methods that are being used to explore beneath cover are Wacker drilling and geophysics. The Asacha license area is not well explored and at least six target areas were identified by Corbett (2001) as requiring follow-up work. The most important of these are the southern extension of the Main Zone structure where the dacite dome is beneath cover, the south western and eastern zones (Figure 3). 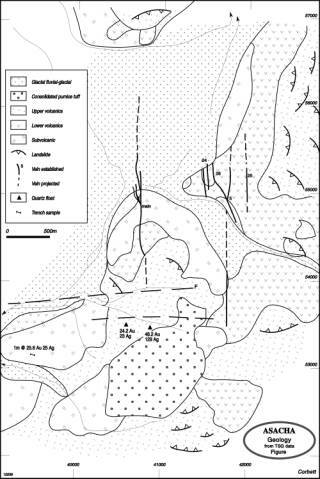 The Rodnikovoye epithermal silver-gold deposit is localized within an eroded volcanic edifice 8 km in diameter that is composed of ignimbrite rocks of Oligocene age whose position is defined according to the 1:500,000 scale regional geology map of Kamchatka by the intersection of the main NNE trending South-Kamchatsky ore-bearing system with the latitudinal Karimshinskaya fault zone. The deposit is situated at the eastern end of the northern-eastern striking VG gold zone. Figure 4. The Rodnikova and adjacent Viluchinskoye and Karbonatniy vein systems. The primary host rocks is a gabbro-diorite intrusion. Mineralization is located within an outer alteration zone of propylitically-altered rocks containing epidote-chlorite-antinolite and chlorite-edipote and an inner zone of kaolin-quartz-hydromica-sericite-adularia alteration. Exmination of adit dump material shows that gold-silver mineralization is associated with veins of adularia-quartz, quartz and quartz-carbonate. Trenching and drilling works show that veins are mainly located in two vein zones, namely Rodnikovoye and Viluchinskoye. Examination of the geology maps shows that the Rodnikovoye vein zone is traced for 5km along a NS-NNW structure and its width varies between 100m and 300m (Figure 4). Drill sections show that veins dip sub-vertically and converge at depth. The average Au:Ag ratio is 10:1. Material examined in outcrop and in mine dumps comprises banded chalcedony with well developed ginguro bands, which commonly host most gold in these systems. Local cuspate colliform banding supplements the general linear crustiform quartz banding. Late stage calcite fills the central portions of banded veins and locally cross cuts quartz (Corbett, 2001). The underground channel samples provide the best indication of gold grades and vein thicknesses at Rodnikovoye. More modern drilling may provide higher gold grades than those identified to date in the smaller diameter Russian drilling that yielded poor recoveries and low gold grades. Ore is particularly associated with areas of higher gold grades such as shoots that have silver grades of several thousand grammes g/t and gold grades of several hundred g/t. As the vein system occurs entirely within a brittle diorite intrusion, only structural and not lithological factors might localise ore shoots (Corbett, 2001). The Kamchatka peninsula comprises many high-grade epithermal-style gold deposits and occureences. TSG/TZ will begin to produce gold from south Kamchatka in 2005, starting with the Asacha deposit and moving on to the Rodnikovoye deposit. Development of the Aginskoye, Ametistovoye and Ozernovskoye deposits by Russian and foreign companies are expected to begin in the coming years. The lack of detailed exploration so far means that further exploration, concentrating initially on the many occurrences, could lead to the definition of significant epithermal and porphyry deposits. Corbett, G.J., 1994, Regional structural control of selected Cu/Au occurrences in Papua New Guinea, in Rogerson, R., ed., Geology, exploration and mining conference, June 1994, Lae, Papua New Guinea, proceedings: Parkville, The Australasian Institute of Mining and Metallurgy, p. 57-70. Corbett, G., 2001. Comments on the Asacha and Rodnikovoye projects, Kamchatka, Russia. Trans-Siberian Gold Limited, 2001 15p.